This is the ultimate step by step guide to installing Python, SQL, R and Bash and starting to learn coding for data science. It takes no more than 60 minutes and it’s 100% understandable for non-developers, too! If you want to be a data scientist, a data analyst or just simply want to analyze the data of your business, sooner or later you will have to learn coding. Here, on the Data36 blog, I provide many articles about coding for data science. However, as a foundation of every further conversation on this topic, you need to have Python, R, SQL and bash on your computer. Once you have them set up, you will be able to practice by yourself (and later build your own data projects too), as well as follow, practice and learn via my tutorial articles and videos. I will show you the exact same tools that are used in real life data science projects. All these tools are completely free! Yes, the funny thing is that most of the super-scientific stuff that you can read about in different data science articles are made using open-source data tools. How cool is that? Anyway: first things first – let’s go and install Python, SQL, R and bash on your computer! Note 1: The article was last updated on 20 September 2018. Note 2: This article is more enjoyable if you do the steps and the coding part with me. If you are reading this on your mobile, I suggest saving the article for later (e.g. send it to yourself in e-mail) and coming back here when you have ~60 minutes and are on your Desktop computer or notebook. Note 3: To have your data infrastructure correctly set up, you simply need to follow my instructions down here step by step — most of the time just copy-paste my code. So don’t be afraid to work on Terminal and writing code. It’s easy, even if you are not a programmer (yet). The article is long, though, because I tried to explain each step as much as I could. I use all my data tools (Python, R, SQL) on Ubuntu – which is a Linux operating system – and I suggest you do the same. My personal computer is a Mac, but you can have a PC too. In this case it doesn’t really matter, because we won’t install Ubuntu on our computer, but access it via the internet. What we will do here is to connect to a remote server – type commands and make the remote server do the data analyses instead of our local computer. Working with a remote server. 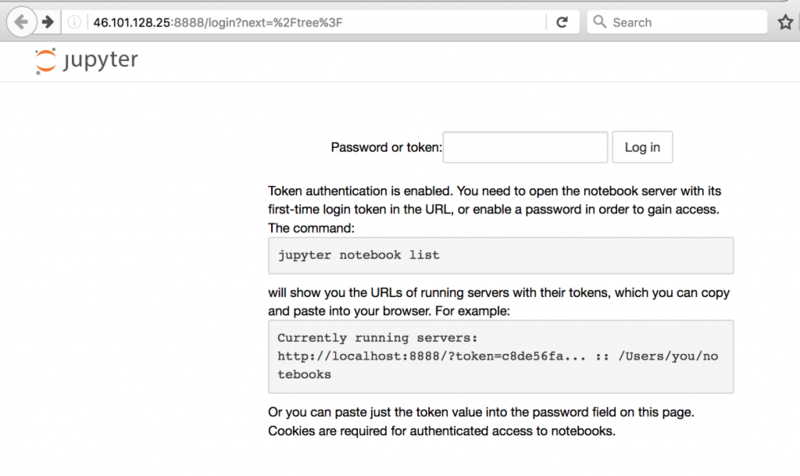 Access your data infrastructure from any computer with a login-name and a password (even if you lose or break your personal notebook). Don’t worry, nobody else will able to access your data on your remote server – it is completely private. Scale your computing power. You won’t be limited to your own computer’s capacity. Renting a few more processors or more memory is just one click away if you are using a remote server. Use Ubuntu without installing it on your computer. The only downside of going with a remote server is that it costs money. Fortunately these prices are very low (starting at $5 per month). I’ve been creating all my coding for data science tutorials (videos and articles) using the exact same data stack that I’ll describe in this article. So if you want to follow me, it will be much easier for you if you go through this article step by step and set up everything like I do. To make everything work properly, please make sure that you don’t miss any of the steps and you do them in the same order as it’s written here! The most important parts of course are the code snippets. All the snippets are marked: like this. 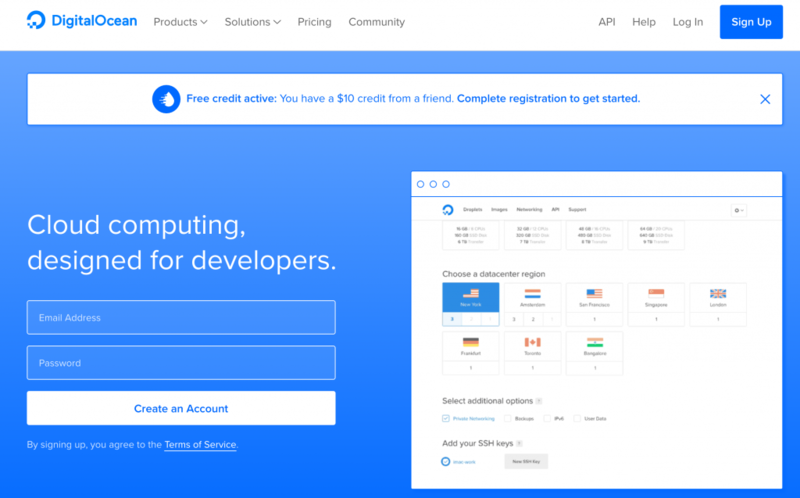 Step 1: Get your remote server! 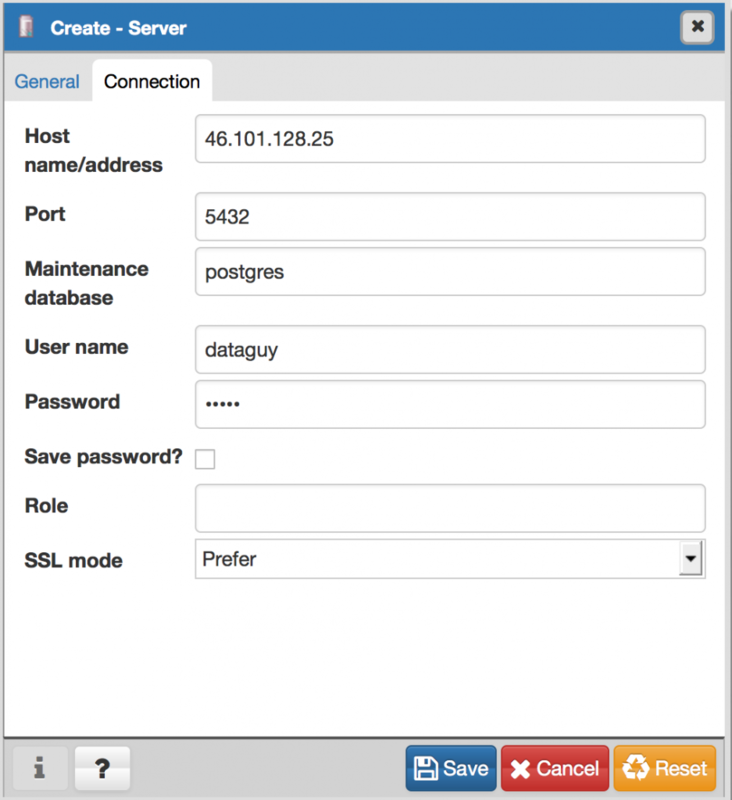 The next step is to find a hosting service to create your first remote server. 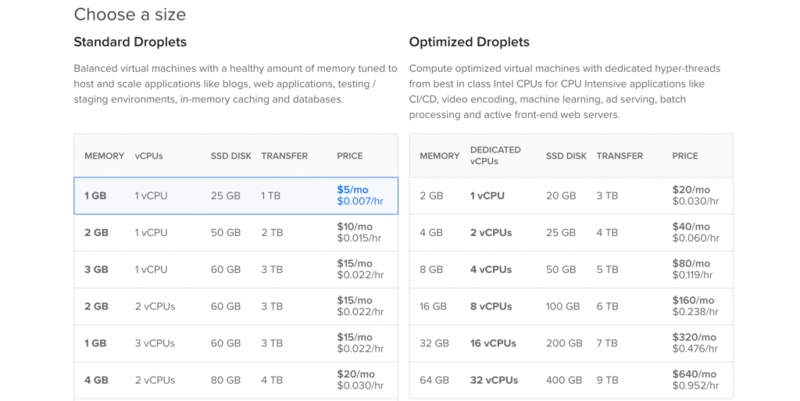 I used many services and so far I’ve found DigitalOcean to be the best. You can rent here a server for $5/month (this will be perfect for us for now). Disclaimer: the link above is a special invitation link – if you use that, you’ll get $100 free credit for two months (and I’ll get $25 free credit). If you don’t want to use my link, you can simply click here instead. Note that in this case you won’t get the $100 credit. If you are done with that, you are just one step away from creating your first remote server. You will see the “Droplets” screen. Click “Create Droplet” (big green button, top right corner). This will be more than enough for now. If needed, you will be able to scale it up in the future. As you can see you’ll pay on hourly basis. This means that if you are using the server for 4 hours only, then delete it, you will pay $0.02. This is a very good deal. “Add block storage:” You don’t need this. “Choose a datacenter region:” Choose the one that is the closest to you. E.g. if you are in San Diego, choose San Francisco and if you are in India, choose Bangalore. I’ll choose Frankfurt as I’m in Stockholm at the moment. “Select additional options:” You don’t need this. “Add your SSH keys:” You don’t need this. Your server will be ready in ~60 secs. CONGRATS! You have your first remote server, where you can install Python, R, SQL and bash and then practice coding for data science. Step 2: Access your remote server! Make sure you save this email, because you will use this information in the future (especially the IP Address). Depending on which operating system you use on your computer, you can access your in server different ways. Open “Terminal” (on Mac I suggest downloading iTerm2 and useing that instead of Terminal). [IP Address] is the IP Address from the email. First download and install a program called PuTTy from here. Click “Open” and you are in. It will ask for your username (“login as:”). You can find this in the email as well. Type: root . 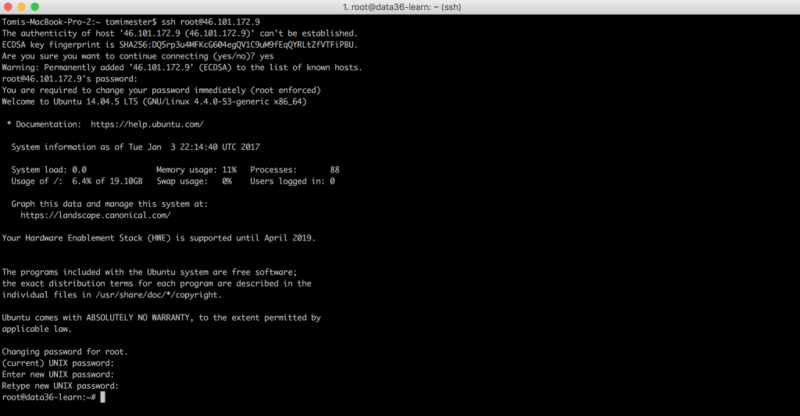 Nice, you SSH-d (logged in) into your remote Ubuntu server. From this point, when you are on the terminal window, until you are disconnected to your remote server, you are going to be using Ubuntu 18.04. It also means that any changes you make here won’t affect your personal computer! Let’s finalize things before we start setting up your data infrastructure! Then it will return some messages to you and ask you to change your password. First, type (copy-paste) the old password again, then type the new one (whatever you want). And done! You can start to install the data tools! You will use bash for every basic server operation – like moving files between folders, creating/deleting files, installing new programs (eg. Python, R or SQL, too), giving permissions to users, etc. It’s great for creating automations. You will have “Hello, World!” printed on your screen. If you hit enter, you will have some text on your terminal screen, then you need to add a new password for this user, some more text, then the name (your name preferably) and you can leave the rest empty. We have just created a new user! This was needed for further steps: so far your username was “root” – and by default “root” user is not allowed to do a few important installation steps that we want to do. Now you are logged in as a normal user. And you can continue by setting up Python3. Step 4: Install Python 3 and Jupyter! Note: previously this article was written for Python 2 – but I have decided to upgrade it to Python 3. Python 2 won’t be supported after 2020. And Python 3 has been around since 2008. So if you are new to Python, it is definitely worth much more to learn the new Python 3 and not the old Python 2. Notice that you get the same effect as it was with the “echo” command on bash. “Print” and “echo” are pretty much the same, but “Print” will work on Python and “echo” will work on Bash. This will stop Python and you will be back to Bash. To use Python more efficiently in the future, you’ll need to install some add-ons. The command line will ask for your password! Remember: it is not the one from the email anymore, but the one you set when you created the new user! Anytime it asks for your password, just type that one. Mc – that you have just installed – is an advanced text editor. We will use it soon. Again if it asks for your password, type it – if it’s asks if continue, say yes. These commands installed pip and python-dev on your server, which will help you to download Python-specific packages. This command upgraded pip to the latest version. This will create a config file for Jupyter on your server. These will add two lines to the newly created config file that will make you able to use your Jupyter notebook from a browser window (like Chrome or Firefox). 46.101.128.25:8888. Well, it’s not a real website. It connects me to the interface of my Jupyter notebook. On this surface you can try again printing the “Hello, World!” string. Once you have typed it, you can execute this command by hitting SHIFT+ENTER. And done! You have installed Python 3 and Jupyter Notebook — and you can come back and use them any time. 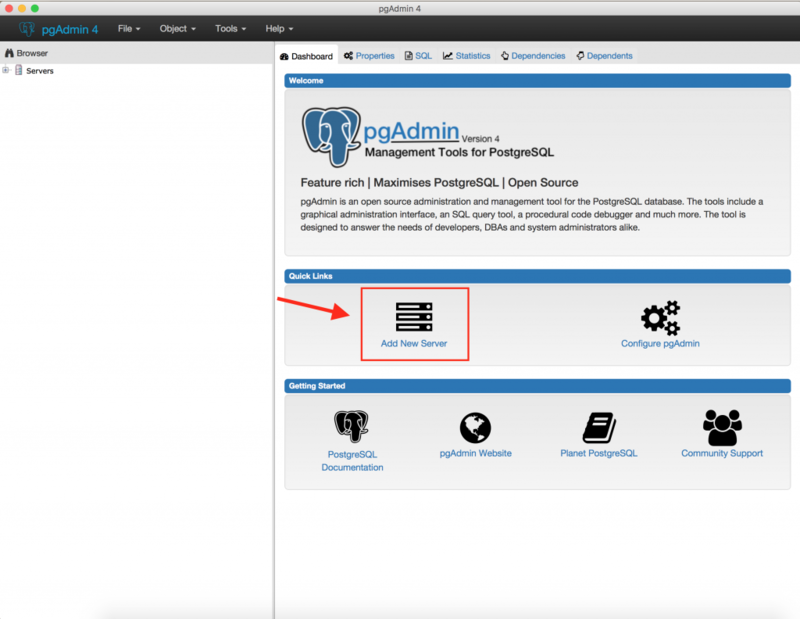 Step 5: Install SQL and pgadmin4! If you are not, just double-check that you haven’t missed anything above… Or just hit CTRL+C several times (that’s the hotkey to skip every running process on your terminal screen). Done! You have postgreSQL just like that. Let’s try to access it! You are in! You can type SQL commands! First thing first, let’s generate a new user, so you can access your database in the future with your normal user too (which is the preferred way). The first line generates a new table called “test.” The 2nd and the 3rd load some test data in it. The 4th prints all the values to the screen from the “test” table! You can learn about SQL from my SQL for Data Analysis tutorial series! It’s time to set up pgadmin! This is a desktop application for postgreSQL that you can use to access your SQL database from your personal computer (without connecting to your remote server in terminal) and write queries much more easily. You will find this program very useful when you start writing complex queries. Then download pgadmin4 from here: pgadmin4. Select your OS, then download, install and run it! Click the Add New Server Icon! Click save and BOOM! You are connected to your database! At first sight, it’s not really straightforward, but you can discover the different folders on the left side. If you right click on the name of the server (on my screenshot: “Data36 Test Server”), you can disconnect from your server. Or connect the same way, when you want to get back. Step 6: Install R and RStudio! R is the easiest tool to set up! That’s why I left it to the end. The syntax is a bit different than it was on Python and much different than it was in Bash. There is an application for R as well to make your coding life easier. It’s called RStudio and you can set it up using these 3 lines of code (copy-paste them one by one)! You can login with your username (e.g. dataguy) and password. (The same, you were using to access your remote server so far.) And try “Hello, World!” here as well. You have installed R and RStudio too! Congrats! 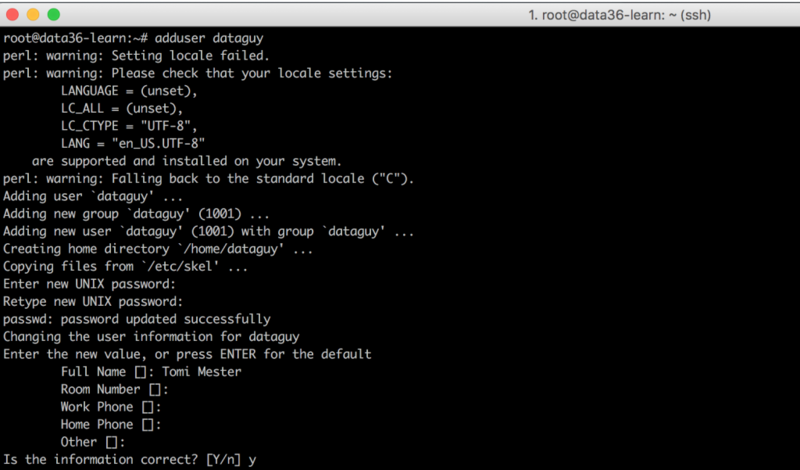 You have created your own remote data server and you have installed Python, SQL, R and bash on it! This is a fantastic first step for you towards becoming a Data Scientist! *shout-out to Johann for finding, reporting and solving the issue! Nice summary, though I think you should really put more emphasis on the security aspects (eg. disabling root access, setting up ufw, etc. but I’m not an expert at all). Nevertheless it gave me ideas how to move forward with these tools (been playing around with Python for only 6 months). – Is there any particular reason why you use Python 2.7 and not 3.x? – Maybe Miniconda could make managing Python stuff even easier. I think it comes with Jupyter by default, and also the conda package manager, replacing pip. What do you think? thanks, nice questions and suggestions! I’ll go ahead and answer them one by one! 2. Is there any particular reason why you use Python 2.7 and not 3.x? UPDATE: I’ve eventually updated the whole article to Python 3.x. 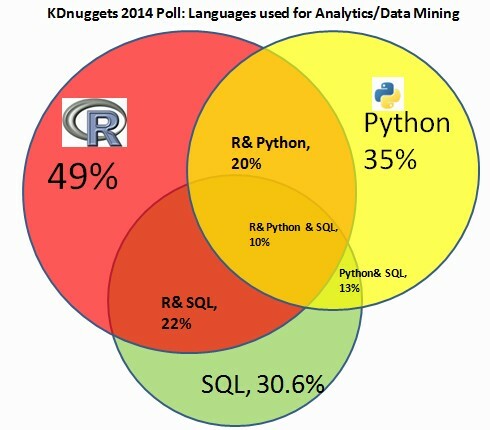 No… I use Python 2.7, because most of the data scientists are using it. It means that all the commonly used data science packages (numpy, scikit, pandas) are supported on that version “better” (not just development, but learning materials). But I’ve friends who are using 3.x without any trouble. UPDATE: Also if you go to a workplace, there is a very high chance, that you have to use 2.7, not 3.x. 3. What do you think of using MongoDB in a similar setup instead of SQL? 4. Does this way of using Jupyter work from behind nginx? 5. Maybe Miniconda could make managing Python stuff even easier. Unfortunately Miniconda doesn’t come with Jupyter (afaik at least), so I left it out for now, because it would have been an extra unnecessary step. But I’ll cover it later too! 6. Also you might want to add some kind of a process manager to restart your dbase in case the server reboots for some reason. Thanks for the suggestions again! I’ll will use them! Most people starting new projects are not in fact using 2.7. Metrics vary from here and there, but any of the (informal) polling done in /r/datascience have shown that hands down 3 is the standard. You’ll see a lot of metrics passed around saying downloads from pip show 2.7 is still more popular, but I suspect that these are skewed with automated dependencies, and also not including new distributions with new methods of install – like Anaconda. Which brings me to my next point – if you’re going to give people info on how to get started with Python, I’d suggest something like Anaconda. Installing binary dependencies can quickly become a nightmare without it, and since you’re using your sys python you’re also looking for trouble there. Anaconda makes using virtual (conda) environments a breeze – leaving the sys python to do what it’s meant to do. Also – for Andras. The goal with learning SQL for data science is because the majority of your data is likely to come from legacy systems, these are for the most part RDBMS, and not NoSQL. No doubt in the future the mix will tilt, but I’d focus on traditional SQL/csv data manipulations first, and then mix in some Mongo later. Also note – Mongo is better at OLTP (transactional) than OLAP (analytical), and often times with analysis you’re going to be working with OLAP (aggregates, crosstabs, etc). Thank you for your 2 cents! Very useful opinions and suggestions. 1. The majority of the workplaces started to use 2.7 and they are still doing it, so if you start to work somewhere, you can expect 2.7 more than 3.x. And thank you for the comments on Mongo! Thanks! The mongo hacks are really nasty, though only instances with lousy security setup are affected I think (a trap a beginner could definitely fall into…). But I’m not a promoter of mongo. You need to know SQL anyway if you’re to work with data, your setup is just perfect for this. Jupyter is not included in Miniconda indeed, my bad. Anaconda does include it, but it felt like a huge overshoot for me when I tried it. Very important question: Am I still able to follow your guide if I use Ubuntu 16.04.1 x64 instead of 14.04.5 x64? I’ve noticed that the command ‘python’ didn’t install it for me, rather I had to sudo apt install python to have it install python2.7 for me, also saying ‘After this operation, 16.6 MB of additional disk space will be used.’ -> I thought I’m working in the cloud? Sorry for the noob questions. Really want to get started with Data Science, but not screw up anything with my personal device. It will need disk space from your remote server (“cloud computer”). So just say “yes” and python will be installed on your remote server. But note that there will be minor differences in the usage compared to Python2.7… Not very big things, but if you want to follow my tutorials in the future (or most of the online tutorials around Python, that’s available online), then it will be easier, if you go with python2.7. Hope, I answered all your questions and good luck on your path to become a Data Scientist!! hey John, glad you like it! Congratulations! I’ve started a nannodegree on Udacity and i think that your article will help me. * Maybe you can make available the articles in pdf. thank you, glad you liked it! And good luck with the nanodegree! One quick question: Can I follow your bash tutorial using bash in my laptop (Mac) ? or is there any benefits for using bash in DigitalOcean server instead of from my laptop ? yes, absolutely – you have 2 major ways to do that. 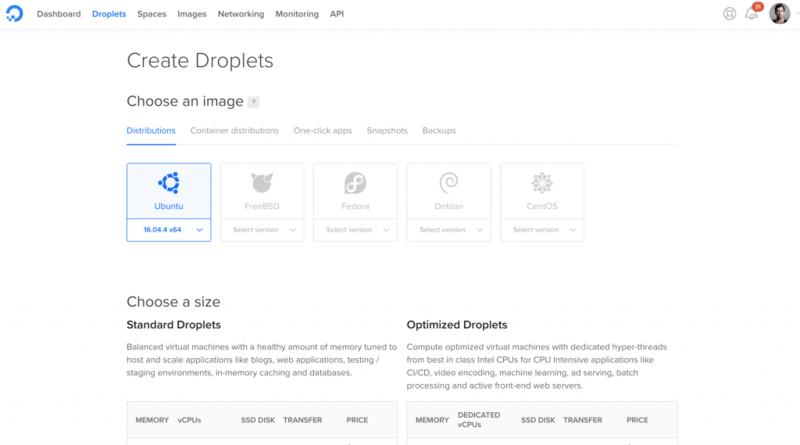 A) You can set up a Linux – Ubuntu 14.04 to your Mac as a second op system (I’d suggest this one)… that’s more or less the same infrastructure, that the DigitalOcean servers have. Sorry, it is probably something obvious but I wanted to run through the SQL tutorial. Based on the info, you’ve provided, it’s a bit hard to tell the exact issue. If it’s so, you should have got an error message or something. Hopefully this will fix the issue! I found the information that I needed. I really enjoyed setting up my own server on AWS and following your tutorials. I am currently on Ep3. Do you have a way of accepting donations? Thanks a lot and glad to hear! Plus, I appreciate your intention regarding donations but it’s really not necessary. Hi , thanks for all the effort you’ve put in. Unfortunately (or maybe fortunately :-)) I haven’t used pgAdmin5 yet. Very good post and good reading. Thanks for your efforts. What I’ll suggest is to use docker images for directly start using Python, SQL, R and Bash (for non-devs). It’s free, you’ll have full control on it (destroy when it’s corrupted and launch a new one). Also, you’ll able to get the latest updates on the software while persisting the data and code you’ve been working on. Basically I run the commands below after having docker set up on my windows PC. Then I hit http://localhost:5050 in my browser. Then I hit http://localhost:8888 in my browser. Use the token printed on your console to login. Thanks Haluk for the very detailed comment! TBH, I’ve not used docker… yet! Will check out and if it works out well, I’ll put this into the original article! Update! Now docker approach with just one command. I get an error: [sudo:restart:command not found] and I’m unable to access R Studio from my browser. Have you seen this before? Any suggestion? Thanks. I think I found the answer to your problem. Sometimes the R install commands are aborting after the “Do you want to install the software package? [y/N]” or after the “Do you want to continue? [y/N]” questions – even if you type “y”. This is a hick-up in their install package and the best workaround is to simply re-run the command if you see that it has aborted after typing “y”. it seems that you are still in bash – make sure you are not missing any of the steps in the article. This time it’s the step where you login to your SQL database with psql. Just a comment, I recomend Pycharm as Python Editor. Thanks Marisa! Pycharm is awesome indeed! In the step below of installing Jupyter, I’m getting this weird message: No such file or directory. This will add one line to the newly created config file that will make you able to use your Jupyter notebook from a browser window (like Chrome or Firefox). Try it with the username you created at the beginning of the tutorial. If it’s still not working, let me know! I’m an idiot, Tomi lol. It’s a little embarrassing, but if you can’t tell already, I’m very new at this. However, I just purchased your program on Data 36 on how to install SQL and the other programs and your video on this section did the trick. Just got started via the $10 starter. Absolutely new to data science or coding. So I’d need some help with the project goals bit. My guess is to go to the MySQL in DEV TOOLS and forget every other item. I guess you missed the previous step when you gave sudo rights to your freshly created user. (As root user) usermod -aG sudo fufu. Any idea why that’s happening? I think the issue is with the type of the apostrophe you use. Now, I don’t know that on you computer which one is which button — but there is a slight difference on how they look, so you can experiment with them by yourself. You typed in the 3rd one, but you will need the 2nd one instead. Yep, that’s what it was! Thanks! hi can i just simply install python, r and bash in my windows laptop? would i be able to follow your articles/intsructions if i do this? In practice, there might be minor differences, so I can’t guarantee anything. But it’s worth give it a go and you can change to the server set up anytime by coming back to this article! The Jupiter notebook is running but I can’t acces it from browser. What can be the problem? I am at my workplace but so far I could do all the instructions written in the article. I don’t think that it is a firewall issue. I assume this one solved as well, right? all the problems are solved I wrote about. great – thanks for the followup!